In recent times the popularity of the humble ukulele has skyrocketed, this has paved way to an abundance of amplified models, which today we are going to explore as we review the top 10 best electric ukuleles. The smaller stature of a ukulele has made it a more suitable choice with benefits that trump a typical travel guitar. Do Electric Ukuleles offer more Benefits than the Standard Ukulele? How do you take care of an electric Ukulele? How do you choose the best and most suitable electric ukulele? Is an Electric Ukulele suitable for a beginner? Some feel they are not loud enough as a stand-alone instrument for performing so seek amplification, and whilst a mic might suffice they are prone to feedback and can be tricky to position to pick-up the sound optimally. Many may want a more direct recording solution, others simply want to experiment with effects and push the boundaries in terms of traditional ukulele playing. 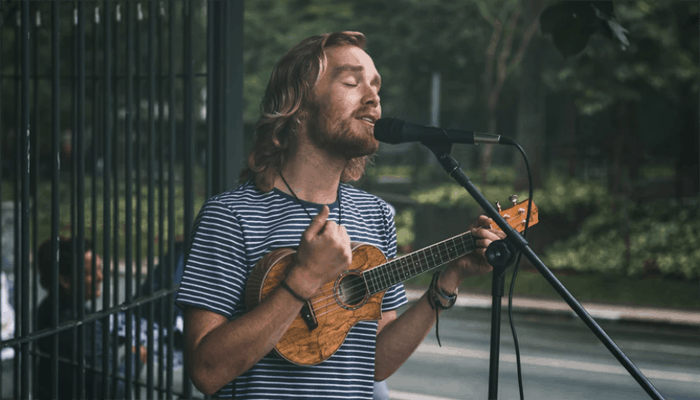 Electric ukuleles are the ideal solution, whether you want to share your strumming with a larger audience or a curious about kick-starting a Hawaiian heavy metal band. Believe it or not, the industry is a competitive one with many companies quick to jump on the bandwagon so we have done our best to wheedle out just what each can do and as always we have presented our findings alongside a detailed buyers guide. Bass, middle, and treble control. We open our reviews with this semi-acoustic ukulele masquerading in an iconic Les Paul cherry burst outfit. This solid-bodied mahogany ukulele has the body contours of the early Epiphone guitars that first gave Gibson a run for their money. It is a 15” scale length Ukulele, it has a triple-A grade flame maple top, which is a good tonewood, and the hardware is a top quality 14:1 nickel machine heads. It features an under-saddle Piezo pick-up which provides a more authentic representation of the instruments natural acoustics, amplifying but staying true to the sound. The pickup routes the sound to an all-metal ¼” output. Why We Liked It - It is pretty cool that you can rock the Les Paul look at your next Luau. 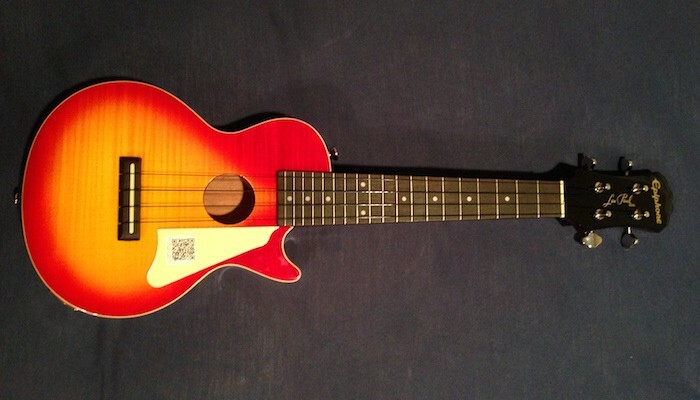 Next we have a completely solid-bodied electric uke, which has no need for a hollow. This one has a sound of its own to match its unique cut-through looks, in comparison to your typical traditional ukulele. It's a little pricier than the Epiphone above but offers up appealing aesthetics that nuke any preconceived notions that a ukulele is uncool. It too is a 15” scale concert sized model, it features a bolt-on fretboard, a rosewood body, and mahogany hardware. It has nylon Aquila Uke strings with great intonation and also comes with a gig-bag full of goodies. It has an active pre-amp which requires a 9V battery, auxiliary input for jamming to tracks and headphone jack for silent practice. Why We Liked It - It is a striking looking Ukulele it handles well is solidly built and fun to play. 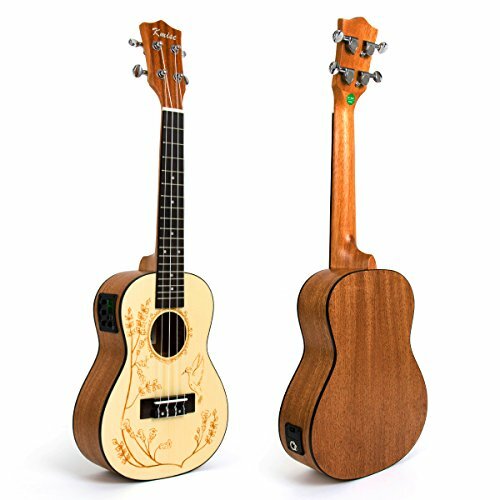 Kmise have used their expertise to come up with a stunning solid spruce top 23” ukulele come traveling semi-acoustic. This honorable hybrid entry harbors some great design details which honestly make it very impressive value for money given its low price tag. It is a concert sized model with 17 frets. It has a 9v pre-amp and tri-band equalization controls for shaping your desired tone. It features a spruce top, sapele back and sides, an okoume neck, and genuine bone nut and saddle. The combination of woods give it great resonance but are also cost effective enough for keeping a reasonable retail price. It comes in seven different styles, each beautifully decorated and strung with a set of high-quality Italian nylon Aquila strings and can be played electronically via a quarter-inch jack or acoustically for quiet practice. + Bass, middle, and treble control. Why We Liked It - It has a bright sound the EQ controls are a bonus to ensure there is no tone loss it also has a built in tuner, the features are impressive for under fifty bucks. A similarly beautiful dreadnought-inspired electronic ukulele design option, could be this delectable handmade offering from SanDona. 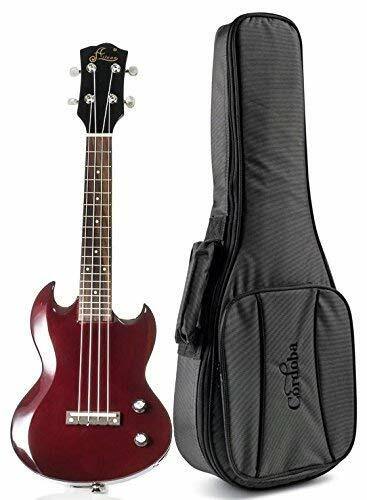 It too makes for a fabulous beginners budget bundle option as it comes with all the bells and whistles of a gig-bag, strap, a set of spare strings, as well as an easily adjustable electronic clip-on guitar tuner to boot. It has a body depth of 2.7”, the back and sides come in curling exotic Zebrano which is available in 6 colors which each compliment their intricately inlaid spruce tops. The fingerboard is walnut and the nut and saddle are genuine ox bone. It features closed tuners which are built from quality components. 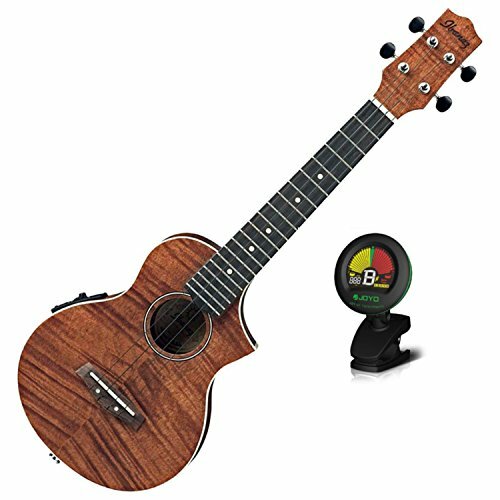 The built-in award-winning Element under-saddle pick-up is paired with a miniature end-pin pre-amp and does a great job of staying accurate to the natural dynamics an nuances of the ukuleles unmistakable tone. + Stunning color customization choices. Why We Liked It - It is a shining example of what you can get your hands on for around a $20 price increase from the budget models we have highlighted today. 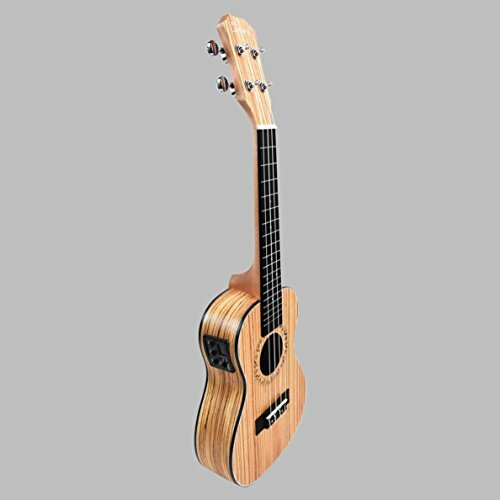 Another Zebrawood option that just manages to undercut the SanDona above by a few dollars is this bare-bones, concert acoustic ukulele. It comes in caramel and has a slightly larger depth than the other models giving it a louder acoustic level than some of its competitors. It is 14 7/8” scale with 18 frets on a rosewood fingerboard. The nut and saddle are buffalo bone and it is a very lightweight instrument. It features a built-in chromatic tuner with an LCD color display and also has 3 band EQ controls on board to allow users to sculpt and adjust their own preferred tone. It comes ready to play with a top-notch set of 4 popular Italian Aquila strings, which take a while to settle in but once stretched keep fantastic intonation and ring beautifully. + Great sound acoustically and electronically. + Built in chromatic tuner. Why We Liked It - It is a great entry level electric ukulele, it has a good resonance acoustically and even packs a few frills in despite its low price. 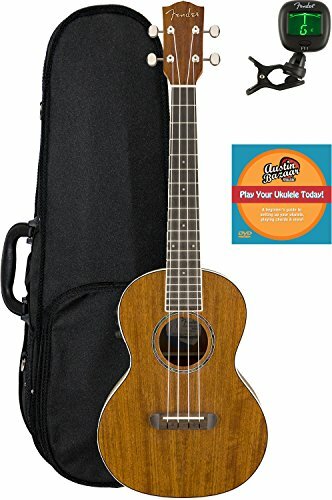 Now for something a bit different the petite Peanut EleUke has been selected for our reviews because is a unique take on a ukulele, it is a super-slim, soprano-sized model, that is certainly smarter than some. Thanks to its recent upgrades it now has modern Bluetooth capabilities which push it into another realm in regards to your practice routines. You can run backing tracks from your smartphone wirelessly and listen to music through headphones and even practice silently which is always a bonus if you have unforgiving neighbors. Its ultra-compact nature and rechargeable battery make it the perfect travel companion. Why We Liked It - It is a fantastic practice model, it has a karaoke machine vibe and allows users to strum along to their top tracks. Next we have a Ukulele that oozes that unmistakable Ibanez style with its cutaway EW body. It is marginally more expensive than the ukulele emulating Epiphones legacy but the craftsmanship is brilliant. It is a concert-style electronic-acoustic uke, with an all flamed mahogany body. The top is solid and has a fantastic natural resonance and tone which the piezoelectric pick-up authentically channels to its electronic output. It features onboard gain and tone control and has Grover chrome open tuning hardware. It comes with a clip-on tuner and a set of black Nylon Ibanez/Aquila strings that the prestigious Italian company designed in partnership with Ibanez themselves. 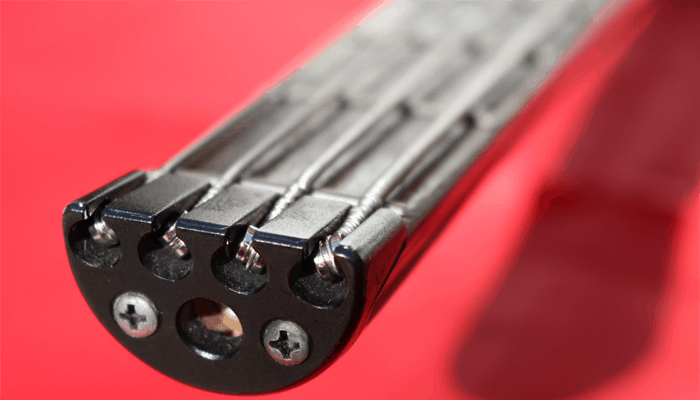 + Cutaway body for better fret access. Why We Liked It - It's a quirky Ukulele, with great depth and natural tone. It is very lightweight and durably built, its solid construction speaks for itself. Time for a top-notch tenor ukulele from the folks at Fender. It serves up some impactive sound for a ukulele thank to its on-board Fishman Kula pre-amp. The electrical nature has been concealed by leaning towards the most natural design elements possible. It features a laminate ovangkol body topped with a solid ovangkol soundboard for superior resonance. 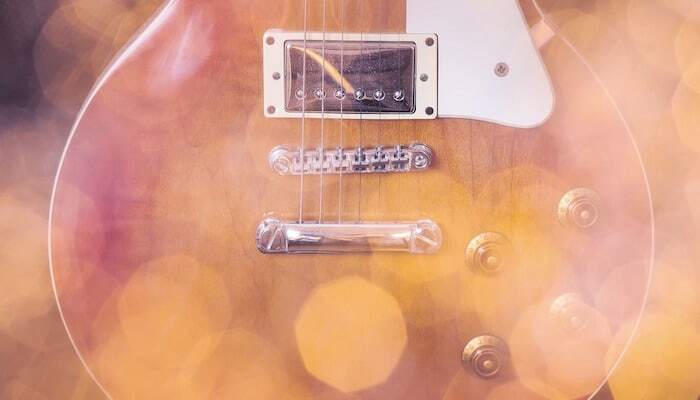 It is decked out with vintage style close back tuning machines on its 2x2 head-stock and is equipped with a no-tie bridge, a bone nut, and saddle and an eye-catching abalone rosette. 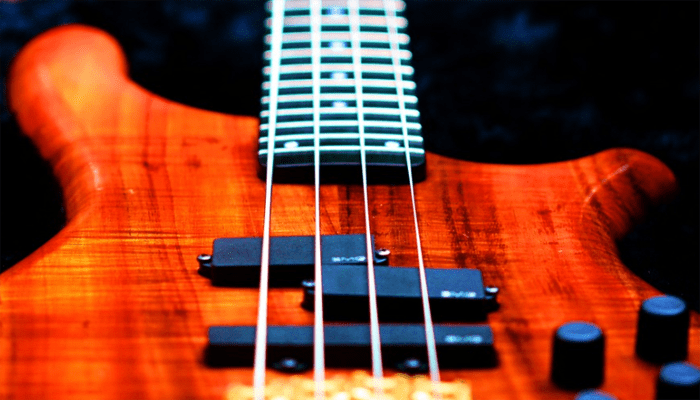 It has a 17” scale length, 19 roomy 1.5 mm frets and is ideal for larger hands. Why We Liked It - It is a reasonably priced tenor option from a trusted, well-known brand. We are big fans of Cordoba acoustic guitars even their entry level models impress, it is no surprise that their acoustic-electric tenor ukulele is a triumphant instrument with tremendous tone and classical good looks. It is completely hand-made and exudes an exotic style with its traditional Portuguese ornamentation and charm. It benefits from a solid top and all the body wood is mahogany, the bridge and fingerboard are rosewood. It is tenor sized and bears a cutaway for access to those extra frets. It features an own brand built in house 2 band EQ Cordoba pick-up and has a glorious depth to its sound. + Inbuilt 2 band EQ. Why We Liked It - It is nice to see a budding company like Cordoba expanding their musical horizons it is a solid ukulele with a wholesome resonance. 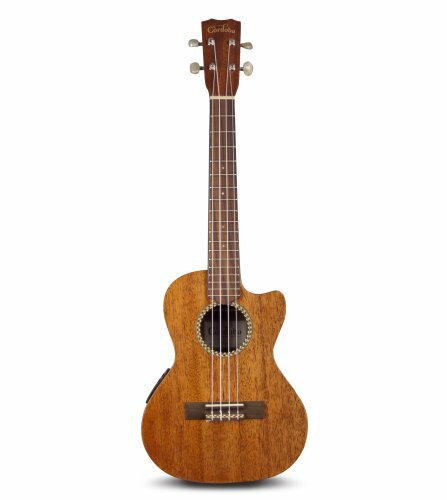 We are ending our review section with our lowest priced solid body electric uke option, which sits just above the hundred dollar mark. It has an SG styled body and comes in a range of colors this one being a deep cherry red. It is a soprano in terms of size and scale, it is on the heavier side but makes a gorgeous performance instrument. It features 2 passive pickups with 2 way switching volume controls for tone adjustment and is naturally resonant as it is comprised of mahogany all over except for its rosewood fingerboard. It's strung once again with 4 Italian Aquila nylon strings and the comfortably affordable price includes soprano-sized gig-bag. Why We Liked It - It is a genuine electric ukulele, it is an eye-catching devilish design and a good choice for those who want to plug in and pluck, plus it wont break the bank. With electric ukuleles being a relatively new hype, we have written our buyers guide with novices in mind. There is no doubt their popularity is down to the opportunities their modern electric offspring offer over their acoustic ancestors. If you are new to ukuleles firstly you are going to want to know which types there are available. The types of ukuleles are categorized by their sizes, which in turn sets their ranges. They are named according to their registers in the same way as singers and other tuned instruments, from soprano to baritone respectively. 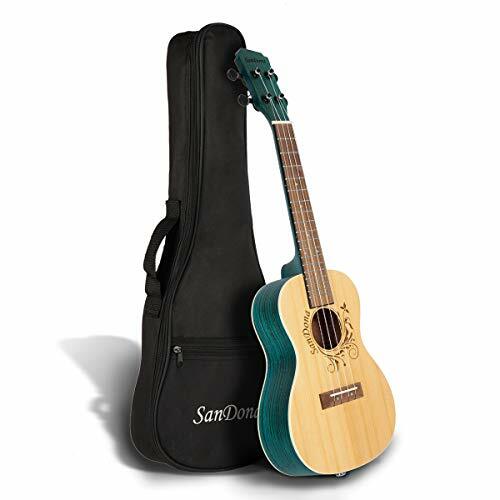 The earliest ukuleles ever made were on the smaller side, they are what we refer to today as soprano ukuleles and because they set the bar, they are often also referred to as standard ukuleles as well. They are around 13” scale length and just 21” in overall length. They are good for younger students and those with smaller hands. They have the infamously bright and sweet treble-tone that we associate with ukuleles in general. They are tuned to G4-C4-E4 and A4 or some prefer A4-D4-F#4-B4 tuning. Next biggest and also the most common ukulele marketed is the concert ukulele. They are also tuned to G4-C4-E4 and A4 or A4-D4-F#4-B4 tuning and can be tuned with their G an octave lower (G3) to have a louder and somewhat deeper sound than the soprano model, despite only being a little larger. They usually sport a scale of 15” and overall length around 23/24”. Tenor ukuleles are tuned G3-C4-E4-A4/G4-C4-E4-A4, /A4-D4-F#4-B4, or D4-G3-B3-E4. They are much more resonant and have a richer chord structure because of the lower tuning. They generally have a scale of around 17”, a length of around 26”, and a slight ore spacious fingerboard. The biggest ukulele and therefore the deepest of the bunch is the baritone ukulele. Its tuning is D3-G3-B3 and E4, which you may or may not notice are the same as the standard tuning for the 4 top strings of a guitar. 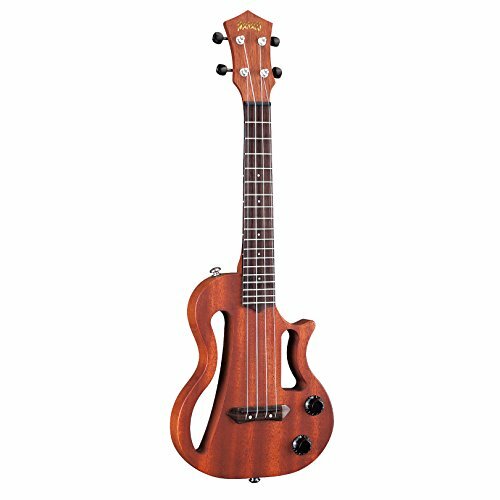 There are 3 kinds of electric ukuleles firstly we have solid-bodied which are pretty self-explanatory, they are not dissimilar to an actual electric guitar just a miniaturized scale-version. They are genuine electric ukuleles and only work amplified. Secondly, we have acoustic electric or electric acoustic which are an acoustic ukulele which has a built in a pick-up that reads vibrations on the soundboard and turns them into electrical signals which then get sent to an amplifier and turned back into audio via its speakers. The other kind is technically speaking just acoustic traditional ukuleles that you have added a non-permanent pick-up too. The benefits of an electric ukulele with its amplification capabilities far outweigh the abilities of a traditional ukulele. They allow for amplification, which can improve performances if you are limited to standing in front of a microphone with your ukulele it can mean performances are more wooden, plugging it in, in the same manner, you would a modern electric guitar gives more flexibility and allows for more of a flair of showmanship when your perform. They can be recorded directly into digital audio workstations for music production and songwriting. Having an electronic output means you can use a loop pedal to layer with and improvise over. It also opens you up to the possibility of sound experimentation by running them through a pedalboard or effects stack. 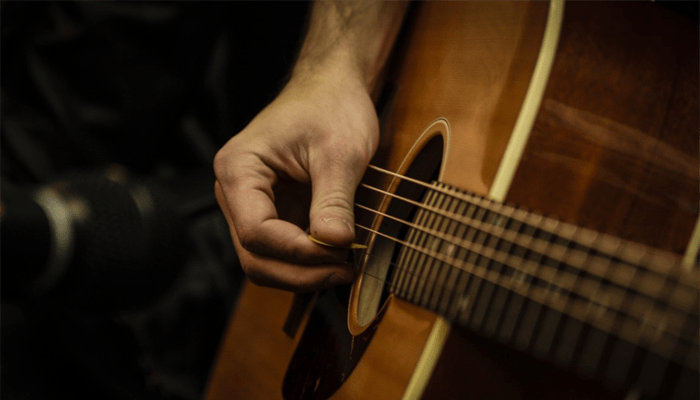 Many electronic models can be played acoustically as well as electronically so why not opt for the electric anyway for all the additional abilities it brings to the table. Other notable advantages they provide are more accurate tuning, auxiliary jamming and even silent rehearing which is a win-win for anyone living in an apartment. Some modern models even have wireless connectivity options built-in these days, in order to keep up with demanding customer conveniences and facilitate the latest trends in technology. If you are a stickler for tradition, and can't find it within you to even think of a solid bodied electric ukulele as anywhere near close to the original article you might want to invest in a good stick on, slide in, or clip on pick-up as an amplification option for your uke instead. 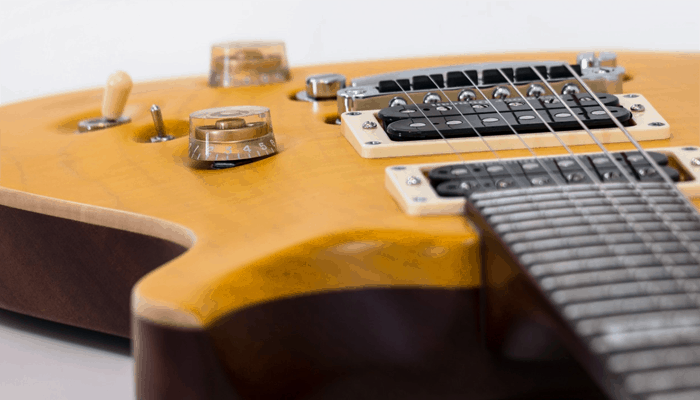 The care requirements of your electric ukulele are pretty simple and don't differ too much from general acoustic ukulele care (or indeed any other stringed instrument). You will need to replace the battery from time to time in some models. It is advisable to invest in a decent hard case for long periods of storage and maybe a humidifier depending on what area you live in to keep your instrument at its best and extend the shelf life of the woods used. 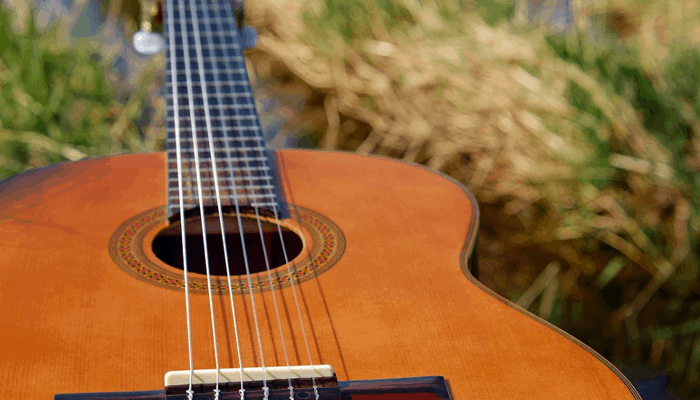 It basically boils down to how often you are likely to play it plugged or unplugged as to whether you pick a solid bodied electric or electric acoustic model in terms of the register it is down to individual preference of the overall sound if you are after that high Hawaiian twang we suggest a soprano. When it comes to what to look for in your ukulele, sometimes it is wise to spend a little more for optimal quality. Cheaper models can have inaccuracies in the frets so the intonation can get less-perfect as you venture up the fretboard. You want to look for tonewoods and if you are shelling out a reasonable sum these should be premium. Mahogany offers warmer tones, spruce tops are bright they vibrate well other typical go-to tonewoods include; koa, cedar, rosewood, redwood, and maple. When it comes to shape there are many different body types, for semi-acoustic models such as the figure of eight, paddle or even pineapple the form affects the natural acoustics and projection of the instrument. A ukulele has just 4 strings in comparison to a 6-stringed guitar counterpart it is less complex to learn and chords are easier to hold. The strings are also nylon which is easier on fresh fingers, making them ideal for beginners, so you needn't worry about learning on an acoustic ukulele first. 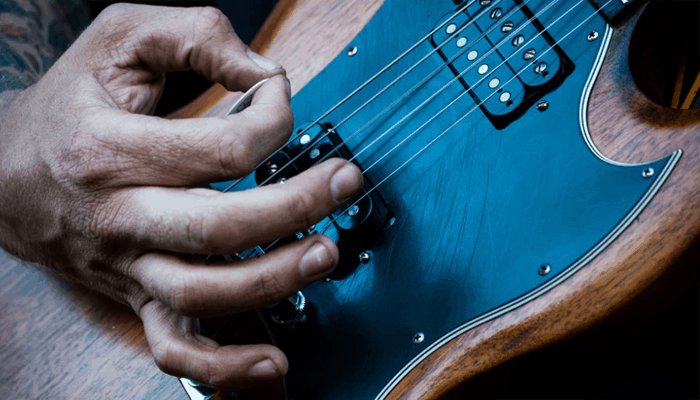 If you have previous guitar experience we recommend trying a baritone as the tuning will be familiar to you and you will recognize the notes to learn the chord shapes with. The chords for a standard or concert ukulele differ a lot from guitar chords because of their unique tuning you will have to learn from scratch. 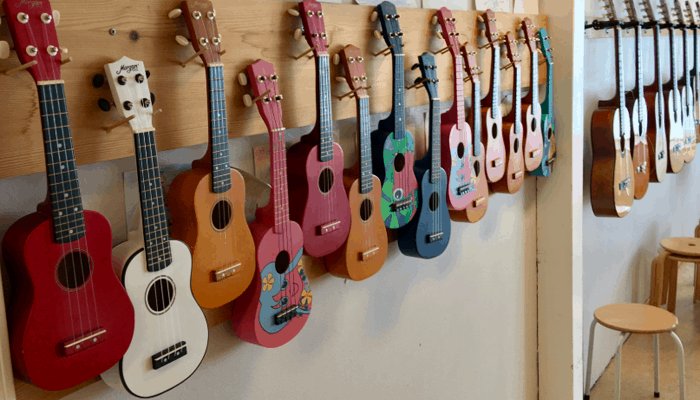 If you have struggled in the past to learn guitar finding bar chords troublesome and complex scales too much of a stretch then a ukulele could be the perfect instrument for you. There are tonnes of affordably priced products out there to choose from, so if the transition to an electronic ukulele tickles your fancy, you may as well bite the bullet and buy one. They serve up a whole host of benefits, that their acoustic originators struggle to compete with. They are suitable for novices and pro's alike, and with modern manufacturing, they needn't be too heavy an investment. We have reviewed ten very different models which represent a good range of what is currently available online. They all impress in different ways which we have hopefully highlighted in today's comparisons. Hopefully having read our reviews and informative guide you will have a little more insight into the world of electronic ukuleles and be suitably prepped before you purchase. Whilst you can use any standard guitar amp alongside your electric ukulele, there are brands out there designing amps specifically for your uke. The small nature of a ukulele makes them ideal for travel and there are some awesome mini-amps available out there like the HoneyTone Mini-amp with its vintage vibes.